Also Recommended: Brother Dear Brother, Revolutionary Girl Utena, Rose of Versailles. Well into the second year on Lillian, Kashiwagi Yumi finds herself having to deal with a lot of things. Some of them revolve around her ever growing relationship with Ogasawara Sachiko, but there's also the fact that she has to start thinking of finding a soeur of her own, not to mention the events taking place at her school. In other words, life continues as usual. When I first started watching Maria Watches Over Us (known as Maria-Sama ga Miteru back then), I wasn't sure what to think or expect. I knew it was about a group of girls attending a Catholic school, and my relationship with Christianity has always been rather formal and casual at best. Which is to say; while I wasn't expecting the show to shove things down my throat, I did expect to end up feeling like a bit of an outsider trying to watch a show I would never ever be able to relate to, much less really get into. Of course, part of that resolve can probably be blamed on another show I watched. The show in question is called Strawberry Panic, one of the many synchro session victims throughout the past years, and one that has been accused of ripping off Maria Watches Over Us. While I wouldn't go QUITE that far myself, I can understand where they're coming from, as there's more than a few striking resemblances between the two, though mostly superficial ones at that. Both are basically starring girls attending Catholic schools and revolves around the relationships between the large cast of characters. It was through my disappointment with Strawberry Panic, however, that I decided to finally try this show out. That, and it was heartilly recommended by not only Carlos Ross' review, but also our own local shoujo fan, Jennifer. And if she said the show was good, well... that was all the encouragement I needed. I'm not saying we take an equal liking to everything we watch, but if she says a show is good, then I trust her enough to know that it most definitely is. So, given that I'm now reviewing the third season, I think it's a safe bet that this show comes with my heartfelt recommendation, wouldn't you agree? Artwise, Maria Watches Over Us has always been fairly exquisite. Background work are usually very well made, even though the first two seasons mostly took place at school and, in a few instances, at the various characters' homes or even in the city. This OAV, however, grants us the opportunity to not only get out into the countyside, but also takes us to various places in Italy, some of them whom I already know from Aria, funnily enough. 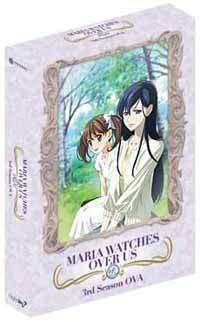 Well, I guess that in some ways, the two shows also share some similarities, ones that count a hell of a lot more than the ones Maria Watches Over Us shares with Strawberry Panic. Characters look a bit more well rounded this time around, compared to the uniformly gaunt appearance of just about every single character in the first season. Undoubtly, OAV budgetry plays a part in this, but my point is that this show has never looked better. Which isn't saying a lot in this case, but yeah... The animation is definitely nice, though I generally tend not to go too hard on that in dramatic shows, especially ones that hint that the characters in it are "encouraged to walk slowly". Characterisation! That's where the true strength of Maria Watches Over Us can be found. Since the anime span through a couple of years (with more to come), there has been -- and will be -- departures and new arrivals, all of them with very variable character traits. In fact, just writing about it right now reminds me that I do kind of miss the loud, boisterous, but still curiously wise Satou Sei. She had a knack of bringing out the best -- or worst -- in people, which always made for interesting viewing whenever she was involved. Still, among the ones who do return, it's always a pleasure to see how they develop, or even how far they've gotten on a personal level. Yumi herself, who, at the start of the first season was a bit of a timid, insecure waif, has developed a delightful amount of sass and backbone, which is exactly the kind of thing I like to see. In fact, the first episode plays out this development brilliantly through a piece of poetic justice that brought out the evil grin in me. And for those of you who remember Shimazu Yoshino's trials and how it just about changed her entire personality -- well, maybe not as much her personality as her potential for development in that area -- will love a scene in the last episode of this OAV, where the second years head off to Italy for a school trip. Standing underneath Michelangelo's "The Last Judgement", Yumi witnesses just how different her friends are, with Toudou Shimako being moved to tears by the painting while Yoshino just offers a dry "What a terribly tubby Lord Jesus." The only newcomer in the show that gets a bit of screentime in the OAV is Hosokawa Kanako, who develops a bit of an unhealthy fixation of what she wants Yumi to be, and it's through the interaction between her and Yumi plus an apparently kindled relationship between Yumi and last season's arrival Matsudaira Touko that we're being set up for what might become the next big story arc once the fourth season arrives. The fact that Touko and Kanako doesn't get along in the slightest adds some much needed spice and anticipation to the show, not to mention expectations to the next season. I did read a complaint from someone at the board that the show felt a bit short. While I don't agree fully with this, I think I can see where the opinion comes from. The show is a mere five episodes, but those episodes lasts more than twice as long as the two preceeding seasons, so I didn't really feel like it was lacking something. Think of it as getting ten episodes merged together in pieces of two. The runtime of the third season is around 40 minutes, give or take a few, shorter than any of the seasons, and that's not all that much, right? With its recent license announced, I've put in the preorder for all three seasons. The show simply has that much going for it, it'd be a shame to miss it, and encouraging companies to go for more niche titles should be always be considered a good thing. Don't let this show be another Princess Tutu, that's all I ask. Recommended Audience: The show doesn't really feature any particular violence save for a few slaps across the face in the first seasons, nor is there any particular fanservice to speak of. Emotional drama may intensify at key moments, though, and with a maturity level that makes it unsuitable for minors.